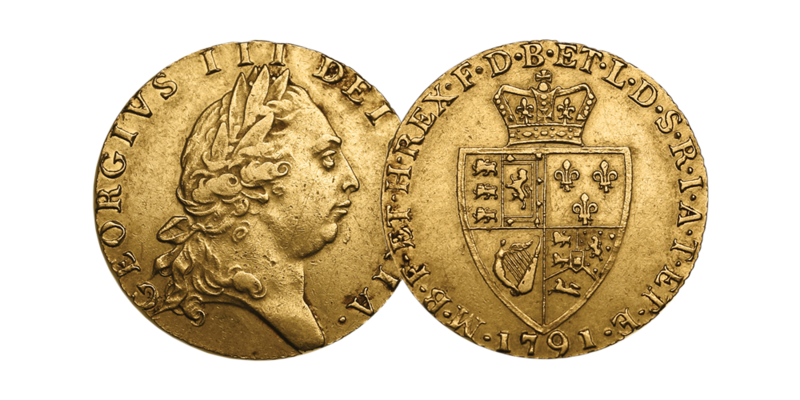 The last type of gold guinea coin issued as coinage in Britain was the ‘Spade’ type struck during the reign of King George III and in the years 1787 to 1799. This was the last type of gold guinea issued and would have been circulating at the time of Wellington’s victory at Waterloo. The design featured a flat-topped shield containing in the quarters: the conjoint arms of England and Scotland, the tripartite arms of Brunswick, Luneburg and Hanover, the Fleur de Lis of France and in the fourth quarter, the harp of Ireland. It is from the spade-shape of this shield that the type gets its name. The portrait of King George III was designed by Lewis Pingo and it was a radical departure from the classical treatment of British monarchs until that time. This design, more modern and crisp than previous issues, was more in touch with the era of the Industrial Revolution to which it belonged. This was the only Guinea ever to feature this unusual design for the shield of the Royal Arms, and only one other coin in history would feature it - the Half Guinea issued in the same era. For this reason the Spade Guinea is of great interest to both historians and collectors. With an extremely limited numbers available, act fast to avoid disappointment. Our heritage in your hands.